Hi :) Thanks for looking at my listing. I wore this gorgeous lace and tulle dress for my wedding last year. I believe this is a very lucky dress as we had perfect weather on our wedding day and we fell pregnant after just a month and now have a gorgeous baby! This dress is incredibly flattering and so comfortable. I didn't want to take it off at the end of the night! 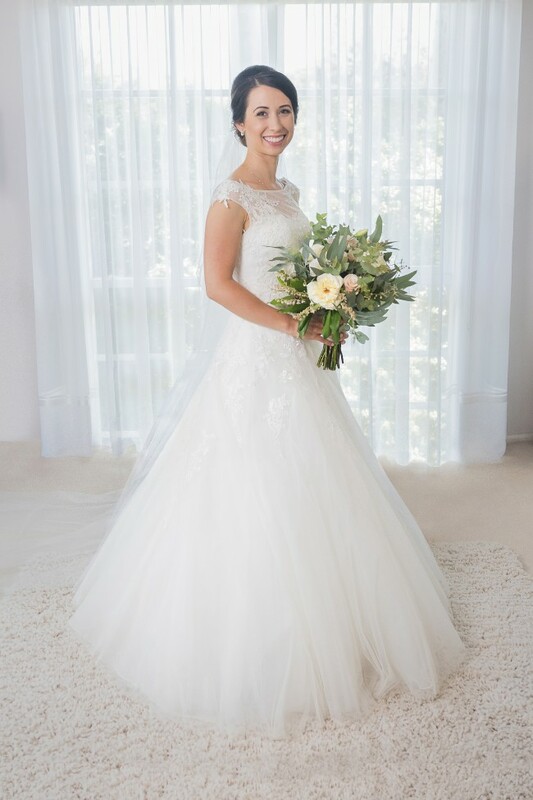 The sweetheart neckline with lace overlay suits so many figures and the A-line skirt is perfect for us ladies who don't love the fishtail style. The bodice is fitted and the bust cups are shaped so no bra is required. There is a corset back so you can get away with having to get the bodice altered. The tulle is so lovely and soft and the lace overlay has several very small sequins in it that catch the light. The skirt of the dress spins out beautifully while dancing. There are a couple of small, not very noticeable holes in the delicate tulle however they are in the hem area so if you have the length altered they will be removed. I am 158cm and wore 10cm heels. The dress hasn't been dry-cleaned yet as I didn't want to clean it if it wasn't going to be sold. Once sold I can get it dry-cleaned or if you would like to sort that out yourself we can negotiate the price :) I can also include the cotton hoop skirt that I had made (I wanted cotton as it's cooler) and the long veil if you would like. If you'd like more information please feel free to message me with questions or requests for more photos. You will look absolutely stunning on you wedding day and also be comfortable. In this dress you'll actually be able to enjoy your dinner and dance all night! The shoulders of the dress were taken up however the excess fabric was left so it can be lowered again. The dress was shortened and there was a train that I had removed as I felt that it didn't suit the dress fabric. Once you send a message, Sarra can invite you to purchase the dress.